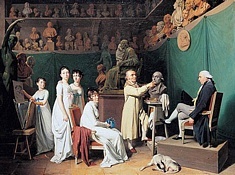 Born in Versailles on March 20, 1741, Jean Antoine Houdon was a French neoclassical sculptor, famous for his portrait busts and statues of philosophers, inventors and political figures of the Enlightenment. Some of his most notable subjects were Denis Diderot (1771), Benjamin Franklin (1778-09), Jean-Jacques Rousseau (1778), Voltaire (1781), Molière (1781), George Washington (1785-88), Thomas Jefferson (1789), Louis XVI (1790), Robert Fulton, 1803-04, and Napoléon Bonaparte (1806). Houdon died in Paris on 15 July 1828 and his remains rest at the cemetery in Montparnasse.